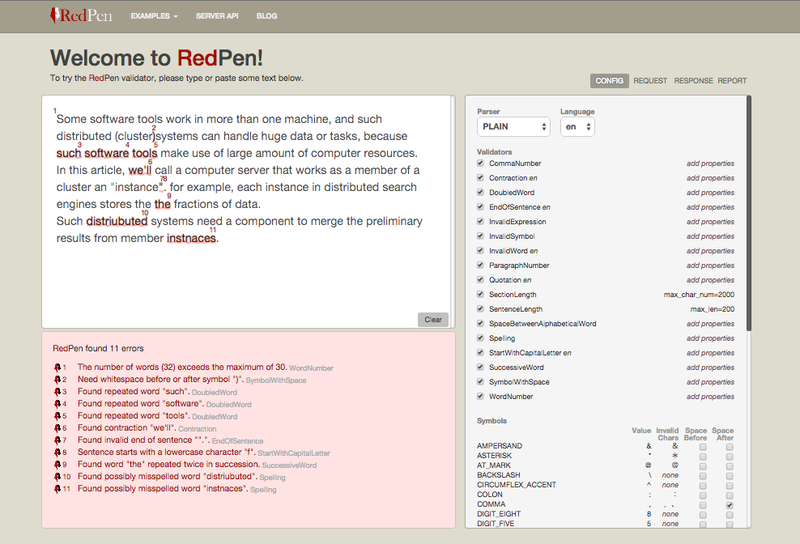 We released RedPen v1.4. We hope that you will download it from the following URL and try using it. The centerpiece of release v1.4 is support for the LaTeX format. In this release, we provided experimental support for LaTeX as an input format. Many people have requested LaTeX support, starting from the initial development of RedPen. Since the v0.6 release, we took one year to support LaTeX, and we finally succeeded. Although these are big constraints, we believe that it would be used to inspect papers and documents. In v1.4, we also concentrated on enhancements the (Validator) functions. To the added functions, three types of language support were added: support in both Japanese and English, support in English only, and support in Japanese only. DoubleNegative In both Japanese and English, double negative statements are difficult to understand. If a double negative is present in the text, an error is output. FrequentSentenceStart When writing a document in English, many sentences can start with We. Because even when there is no problem with the content, the appearance is bad, and therefore it is good to swiftly replace them. Consider the following example. We in the above example has been used twice in a row. Without changing the meaning, we will edit the sentences to prevent continuous use of the same subject. UnexpandedAcronym This function checks documents for the presence of acronyms and also for the original words that they represent. WordFrequency If the word frequency within the document differs from the usual, an error is output. Hyphenation If hyphen usage is not correct, an error is output. NumberFormat If number formats differ from correct usage in English, an error is output. ParenthesizedSentence This function inspects for usage of parentheses. If there are nested parentheses or more parentheses than specified, an error is output. WeakExpression If the text has an ambiguous English expression, an error is output. For example, words such as completely and huge should be replaced with more accurate representations. Okurigana If Japanese okurigana word endings are used incorrectly, an error is output. DoubledJoshi if a particle is used more than once in a sentence, it might be difficult to read. RedPen is an open source command line tool for proofreading documents, but RedPen also provides a server. This article introduces the functions of the RedPen server. The RedPen server provides not only a Web UI but also a REST API, which enables users to check their documents without installing RedPen on their computers. One of the features of the RedPen server API is its configurability. Users can validate their documents according to their configuration settings. In addition, the server can be deployed with few clicks in Heroku. The below image shows the current RedPen Web UI page. When a user visits the RedPen server at the URL above, the top left box is automatically preloaded with sample text that contains many mistakes. RedPen shows the errors in the top left box as red bars. The bottom left window provides detailed error information. When users paste their documents in the box, any validation errors are displayed in the left bottom box. We can configure the settings in the right box. Specifically we can configure validation items and character (symbol) settings. For detailed configuration information, please see the RedPen configuration document page. The RedPen server provides a REST API that enables users to apply RedPen validation without installing RedPen. Currently the RedPen server API provides three types of validation. This function returns validation errors using preconfigured redpens. This function validates a document with the user’s configuration and then returns the errors. This function is similar to the /document/validate function, but the configuration is written in JSON format. The /document/validate function has several parameters. lang specifies the language used to tokenize the document. Currently, values of ja (Japanese) and en (English/Whitespace) are supported. format determines the format for the results. This can be either json (the default), json2, plain, plain2 or xml. config contains the contents of a RedPen XML configuration file. Now let us try the REST function with both configuration and text. The following is a sample RedPen configuration file (redpen-conf-en.xml) bundled with the RedPen package. Next we validate a short input sentence with the RedPen server. The following command sends the document and configuration. curl --data document="Twas brillig and the slithy toves did gyre and gimble in the wabe"
Spelling: Found possibly misspelled word "brillig". Spelling: Found possibly misspelled word "slithy". Spelling: Found possibly misspelled word "toves". Spelling: Found possibly misspelled word "gyre". Spelling: Found possibly misspelled word "gimble". As we see, the RedPen server returns several errors in the input sentence. In the previous sample, I was using a server already deployed in Heroku, but this server is not powerful enough if many users send their validation requests. If you need short response time, of course you can deploy the RedPen server in your own environment, but this could be tiresome. 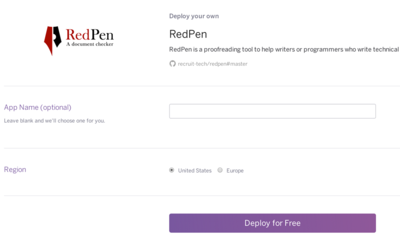 For users that would like to deploy their own server easily, RedPen provides a Heroku Button. Users can deploy the RedPen server with just a few clicks. The Heroku Button can be located in the README of the RedPen source. When we click the button, then the following page is shown. When the user clicks the Deploy for free button, the RedPen server is deployed in a few minutes.